My partner's iMac is my old one from 2008 (it's kinda great that it still works like a dream!! ), running macOS 10.11 and running 1Password v6.8.8 from the Mac App Store. Mine is a late 2012 model running macOS 10.14.2, 1Password 7.2.4 and I'm signed up with an individual 1password.com account. Main question: Is it possible to set up a vault that can be shared between our iMacs and different versions of 1Password? 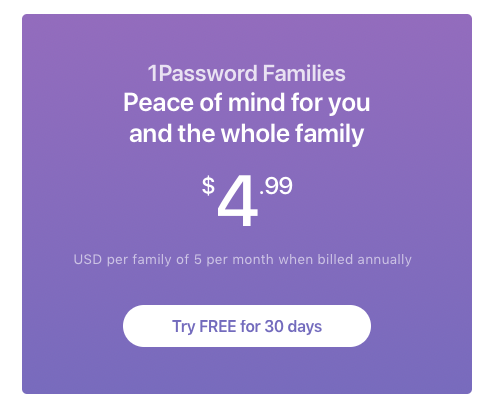 A family plan is the ideal solution, and I'd be happy to upgrade, but that requires 1Password 7 and v7 requires 10.12 or above and his iMac is maxed out at 10.11.6. Is there a solution that will allow us to share a vault? @moosh: It's hard for me to get excited when I hear about people running old stuff because...well, security...but it's totally awesome that you've gotten so much mileage out of that iMac! Mine is a late 2012 model running macOS 10.14.2, 1Password 7.2.4 and I'm signed up with an individual 1password.com account. Main question: Is it possible to set up a vault that can be shared between our iMacs and different versions of 1Password? 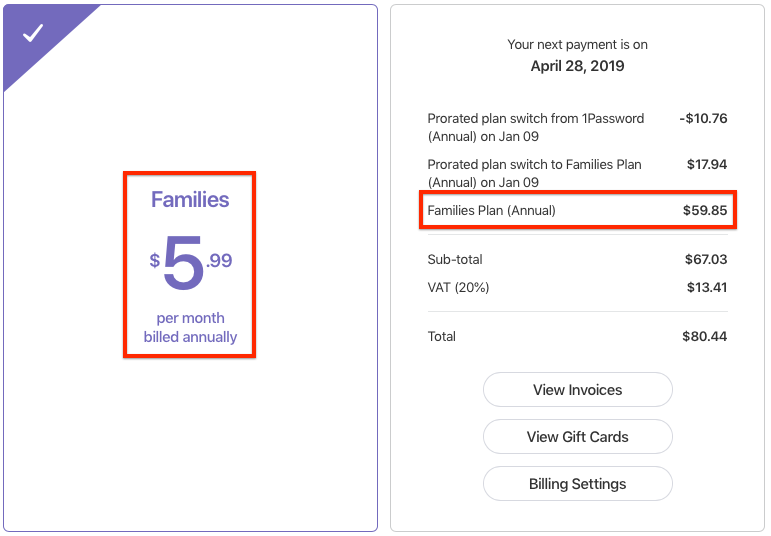 A family plan is the ideal solution, and I'd be happy to upgrade, but that requires 1Password 7 and v7 requires 10.12 or above and his iMac is maxed out at 10.11.6. Is there a solution that will allow us to share a vault? So, here's the thing. 1Password Families does not technically require 1Password 7. 1Password 6 will work for now. However, since the old version is no longer receiving updates, it will likely stop working with the membership in the future when we have to make changes to how the service works, since the old app will not understand those. So I wouldn't recommend that as a long-term solution. Similarly, 1Password X or the 1Password.com web interface will work in a browser that is up to date, but when the browser cuts off support for El Capitan you will eventually be out of luck there too. However, that would likely be farther off, and maybe that gives you breathing room until you upgrade the Mac. Food for thought. 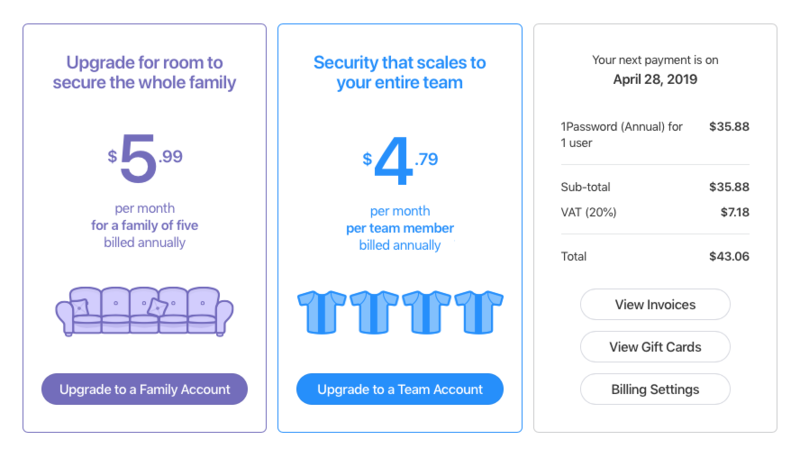 Other than those caveats, 1Password Families makes it really convenient to share vaults securely with your loved ones, across all platforms and updates. The alternative would be to sync a local vault without an account using Dropbox...but that's a bit of a pain, and then again when Dropbox drops support for the old OS you're kind of stuck again. Anyway, let me know what you think, and if there are any other factors that might be relevant -- or other questions you have. Thanks @brenty – speedy and detailed! I'll probably try families for a year and see how it goes after that. I'll porbably have upgraded something by then! Next question. What is the actual price for a families plan? Your main page says $4.99, but when I choose the upgrade option from within my 1Password account it says $5.99. 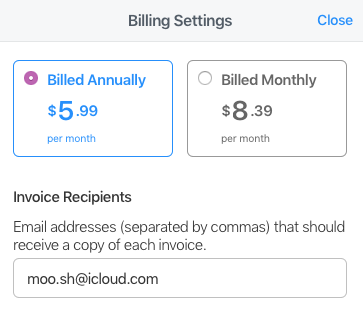 @moosh - if you're seeing a price of $5.99, that's because you're looking at the monthly payment option, rather than the annual. With the former, we have to bill you twelve times in a year instead of just the once, so it's a dollar more expensive. That's why the purple price icon you included a screenshot of says "...per month when billed annually." If you switch your account to the annual billing option first, that should get you the $4.99/mo price (annual amount actually billed will be $4.99 x 12 = $59.88). @Lars – That's not at all clear. 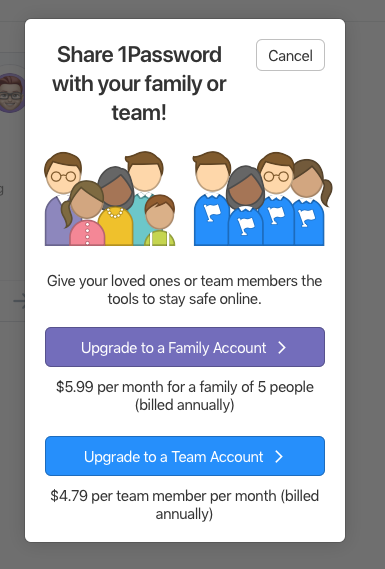 The other screenshot I uploaded from the upgrade screen also says quite clearly, billed annually: "$5.99 per month for a family of 5 people (billed annually)". And again on the billing screen. To me, it seems like I'm being asked to pay $5.99 a month billed annually, i.e. $71.88 – and I'm already on the annual billing cycle. @moosh - ahhh, I think I know what's going on here. Are you located somewhere besides the USA? Are you looking at 1password.com or 1password.ca? In that case you may wish to check out the geographically closer-to-you https://1password.eu which is located in Germany and bills in EUR instead of USD. Thanks @Ben – I tried to log in at 1password.eu but there seems to be a problem. Even though my details are correct (I double-checked) and entered correctly (I double-checked) I get the message "The email address and Secret Key are not correct." Regardless I went ahead and upgraded to a families plan anyway. To be clear, I don't mind paying what I am supposed to pay. What is confusing is the fact that at every step along the way the indications are that I will be charged $5.99 per month billed annually. It very clearly says that, even in this screenshot that I took after I upgraded. The exact words are: "Families $5.99 per month billed annually". There's no other way to interpret that sentence. But what I am actually being charged is $4.99 per month billed annually (the bit I've highlighted in the screenshot). So to recap: now that I've pressed the upgrade button a looked at the calculation I'm happy that I'm paying the correct amount (i.e. $4.99 per month billed annually) but literally all the customer-facing indications are that it's $5.99. Even in the Billing Settings. I am sorry for the confusion! The prices you see include 20% VAT. This is certainly confusing. In North America the tax is shown separately but in Europe we include the tax amount ($4.99 + 20% = $5.99). I opened the ticket and we will try to improve the wording.